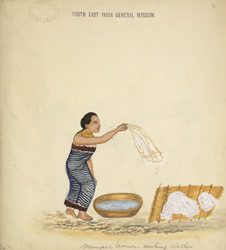 bl.uk > Online Gallery Home	> Online exhibitions	> Asia, Pacific and Africa Collections	> Manipur women washing clothes. Watercolour of a Manipur woman washing clothes, by an unknown artist working in the Manipur style, c. 1870. Inscribed: 'Manipur woman washing clothes'. The state of Manipur, literally "Jewelled Land" is located in the North East of India on the border with Myanmar. Manipur came under British Rule in 1926, after years of clashes with Myanmar and with the Nagas, a major tribe located in the state.